Canada is the Newest Country to Question the Safety of Monsanto’s Roundup Herbicide. Another big player has entered the debate as to the safety of glyphosate based herbicides, Health Canada. Bayer’s Monsanto is the developer and biggest manufacturer of glyphosate weed killers. It is the primary active ingredient in their Roundup and RangerPro line of products. Health Canada’s Pest Management Regulatory Authority re-approved the use of the controversial weed killer in April 2017. But now more reports of human cancer and questions about the reliability of the science behind the agency’s action are raising new questions. Canada’s National Observer reports the agency recently received 68 reports of “serious incidents” involving cancer allegedly because of exposure to glyphosate. Many of the reports came from Monsanto itself but the agency apparently claims it wasn’t provided enough information to evaluate the claims. Even after the agency’s decision last year to re-authorize the use of glyphosate was announced, several Canadian health groups objected. “Health Canada has dismissed credible evidence in its re-evaluation of the world’s most extensively-used pesticide, glyphosate, in today’s decision to continue its registration in Canada. 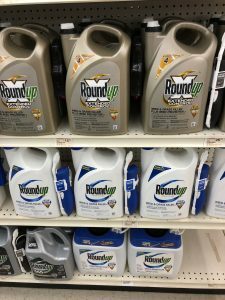 “Glyphosate is infamous as the active ingredient in Monsanto’s herbicide Roundup and is now used in hundreds of other herbicides manufactured by many of the largest agrochemical companies. In the latest Canadian challenge to the popular weed killer, environmentalists say Bayer manipulated some of the studies relied upon by Health Canada. Environmentalists and public health advocates all over the world have been buoyed by the recent jury verdict against Monsanto in California. There jurors linked the terminal non-Hodgkin’s lymphoma suffered by a former school groundskeeper to RangerPro, a glyphosate based herbicide. Monsanto has a long history of deception. We believe the company hid the risk of PCBs for decades. Why should we trust them now? Some of the labs used in the original U.S. safety studies were implicated in widespread fraud. In fact, some folks from the lab were convicted and sentenced to prison. We also know from internal emails that were recently produced that people within the EPA and Monsanto have their own fears of both glyphosate and the mixture of glyphosate and the surfactants used to make the product stick to plants. We don’t know if there is a link to cancer. But we suspect there are folks within Monsanto and some of their lab partners that do. Companies that are doing nothing wrong tend to be transparent. Monsanto talks about “transparency” but they certainly don’t do much to show that transparency. Patient Cases: Mahany Law is seeking cancer patients with repeated exposure to glyphosate based products. If you or a loved one were diagnosed with leukemia, lymphoma or myeloma and regularly used Roundup, we certainly wish to speak with you. We believe there is a medical link between certain cancers and glyphosate based products. Under U.S. law, the manufacturer of these products can be held liable for losses such as medical bills, pain and suffering, future medical bills and treatment expenses and lost wages. If you lost a loved one due to the above cancers, you and your family may also be entitled to compensation. We are best able to help those who were exposed to glyphosate through gardening (commonly through the use of Roundup), farmers, landscapers and groundskeepers. There is a growing body of science regarding the risks to ordinary citizens who eat food contaminated with glyphosate. Unfortunately, we don’t yet know much about the risks of exposure to residual glyphosate but we know that it is today found in many of the foods we eat including kids’ cereal. Monsanto – Bayer Whistleblowers: We are also looking to speak with people who work or worked at Monsanto or any of their independent laboratories and have information about the cancer risks of glyphosate. MahanyLaw began as a whistleblower law firm. Insiders are usually the best sources of information. Although we often cannot pay you for information, we are always interested in protecting the public and shining a light on wrongdoing. If you wish to speak to us off the record or provide us with documents or studies or even just tell us where to look, contact us. Even if anonymously. For more information, visit our Monsanto cancer patient claim center and whistleblower page. That page has two excellent videos, one for cancer patients and one for whistleblowers. Both have “share” buttons allowing you to share the video with others. We hope both these videos go viral and you can help by reposting on social media! or by phone at 202-800-9791. Whistleblowers please call 414-704-6731.